Nolde Forest encompasses more than 665 acres of deciduous woodlands and coniferous plantations. A network of trails makes the center’s streams, ponds, and diverse habitats accessible to both students and visitors. Teaching stations offer places for students to work and benches for those who wish to sit and enjoy the sights and sounds associated with the natural world. ADA accessible trails are located by the mansion and sawmill. The Nolde Mansion houses offices for the center staff. A garden featuring native wildflowers is adjacent to the mansion. The C.H. 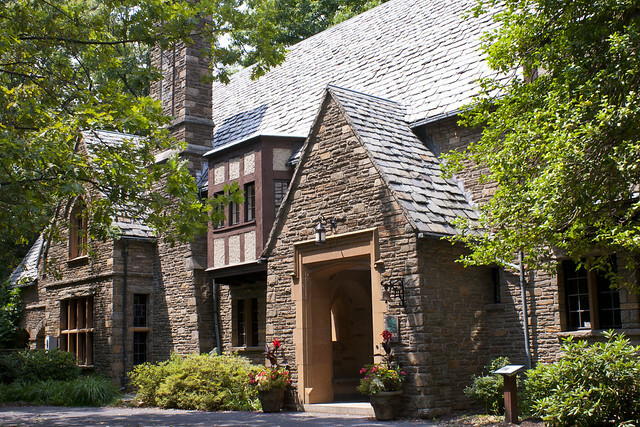 McConnell Environmental Education Hall near the mansion is the indoor site for year-round programming. The center is open every day of the year, sunrise to sunset. The office and mansion parking lot are open 8:00 A.M. to 4:00 P.M., Monday through Friday. Contact the center office for facility seasons and hours. Nolde Forest is in Berks County, Pennsylvania, on PA 625, two miles south of PA 724 or three miles north of PA 568. The center office is located on Park Office Lane. Nolde Forest is committed to providing a diverse array of environmental education and interpretive programs. Programming is offered year round to schools, civic groups, and the community. A schedule of community programs is available at the center.